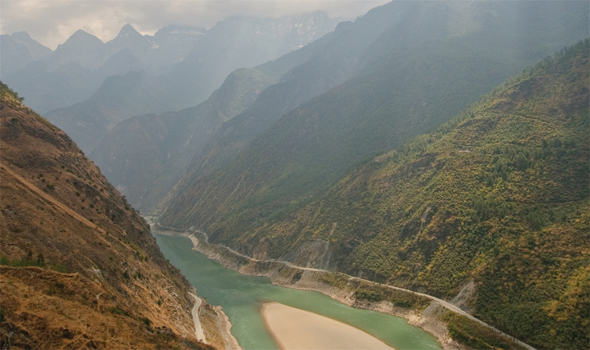 Somewhere high up in the Himalayas, the mighty Yangtze River embarks on a long and arduous descent. Beginning its journey as a tiny creek at its apex, the Long River (as it is known in Chinese) transforms over its course, forming a series of bounding rapids and hurtling waterfalls before settling into its slow, flat demise into the East China Sea. About 65 km north of Lijiang in Yunnan Province, the river descends into one of the deepest and most intensely beautiful canyons on earth – the Tiger Leaping Gorge. 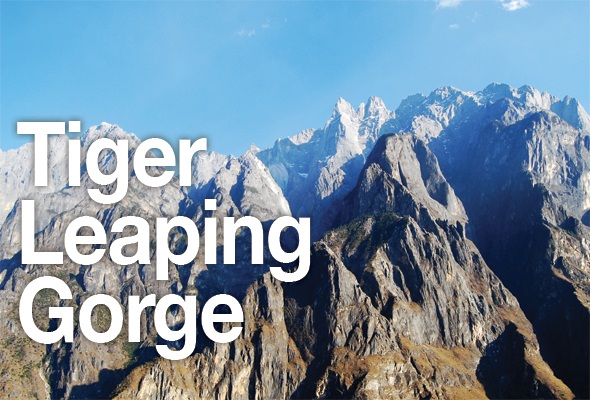 Legend has it that many years ago, a local hunter was chasing a fierce tiger that leapt onto a rock in the middle of the gorge’s narrowest junction to his escape, leaving his legacy in the name of the place – Hu Tiao Xia or Tiger Leaping Gorge. Tiger Leaping Gorge is the steepest and narrowest canyon on earth situated in a remote suburb of Shangri-la. The mere mention of a place so alluring whetted my appetite for true paradise on earth that is becoming a rarity in our modernized world. I had to experience for myself this gem of a place– the last of China’s lost heavens. My journey to Tiger Leaping Gorge begins in the city of Lijiang, a UNESCO World Heritage Site known for its ancient architecture and ethnic minority, the Naxi People. Once a trade center along the old tea roads to Central Asia, Lijiang is one of the last stops before Tibet and its series of waterways and canals meander through carved wooden edifices that are interconnected by cobblestone streets. 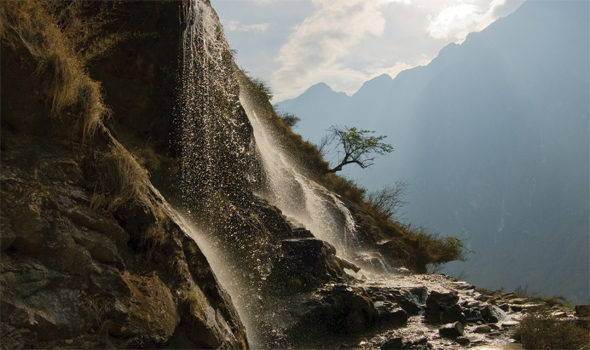 Hiking along one of the two trails that span above Tiger Leaping Gorge requires just a short day. But why rush through the experience without savoring its beauty and splendor? So I opted instead to spend two nights and three days hiking the gorge. Camping here is virtually impossible because the trails are extremely narrow; however, there are many guesthouses operated by the locals who once made their living farming grains. They are now spending their days providing food and accommodation to adventurous foreigners who come seeking the thrills of Tiger Leaping Gorge. The gorge measures about 15 km long, but hiking through the sandy paths created by the locals for access in and out of their homes on the steep cliffs proves to be a much longer journey, almost double the gorge’s length. Two trails provide a way in: the low road and the high road. The low road offers quick access to tour buses and the high road is a steep hiking trail sought out mostly by the adventure seekers. The trek begins in the tiny town of Qiaotou, where, equipped with a hand-drawn map, I side-stepped a truckload of touts and made my way to the start of the trail. The Yangtze flows right through Qiaotou, which is not more than a one-lane village with loose chickens crossing the road under the beginnings of mountain green mountaintops. Most inbound hikers to Tiger Leaping Gorge are required to pay a ¥50 entrance fee, but that day the dusty guard station was empty, so I continued along the path, which was lined in wildflowers and weeds and narrowed into a small track carved into the hillside. Below, the mighty Yangtze narrowed with it in a rush of grey water, and before me the hill swept up into a swath of green. The first few kilometers trek steadily upward in a gentle incline until you reach the 28 Bends, an aptly named series of steep switchbacks that bring you over a tangle of rocks and weeds straight up the cliff side. The view becomes intense, at times almost vertical as the gorge opens like a chasm below and little more than a few dusty boulders separate you and imminent death. As the bends wore on, my feet began to burn and slip under the loose rocks, and about halfway to the top, I met a toothless lady selling green tea and Snickers bars. “Hashish?” she asked with a wry smile. I gently declined, ordering instead some cold tea to sip on. A high wind caught the flags flying over the Tea-Horse Trade Guesthouse, where I stopped for the day and readily ordered a large bottle of cold Tsingtao and a plate of fried noodles. The huge porch here offers stunning views of Jade Dragon Snow Mountain, which stands in awesome grandeur on the opposite side of the gorge. Despite early May’s spring temperatures, the mountain was still capped in a white blanket of snow, indicating its altitude and, below, the green river steamed in quiet serenity. The following day, I made my way down to the Tiger Leaping Stone, where the mythic tiger supposedly landed mid-river as he fled from the hunter. To get there required a tricky encounter with a waterfall before arriving at a serene bamboo grove. Below, the gorge dived into what seemed like eternity, while the bamboo trees above wafted back and forth like feathers. Terraces of tea fields laced along the slope of the gorge and the icy azure waters of the Yangtze flowed in harmony below, winding their way out to freedom. To get down to the Stone, you must follow a long, narrow staircase before finally arriving to the roar of the river’s rapids. An unstable-looking rope bridge offers the possibility of retracing the tiger’s jump across to the massive boulder, which sits like a sentinel in the middle of the gushing waters. I took the chance and, once across, laid down there on my back, watching the walls of the canyon rise like rocky pillars above me and enjoying the sprinkles of the mighty river over my face. My second night on the gorge was spent at Sean’s Guesthouse, a budget friendly accommodation, one of the last inns along the high road. The inn’s leafy Eden-like gardens brought spring to life and a scenic place to relax. Here, I met several backpackers from all over the world, and we strayed into a dreamy evening, drinking cheap Tsingtao around a glowing campfire. As the river flowed steadily below us, we exchanged stories about our travel experiences, about lives back home and most interestingly, the various encounters on the road to Tiger Leaping Gorge. Too soon, the fire quelled to dying embers and my friends retreated into their rooms to sleep, leaving me alone under the inky sky, trying to find the North Star. My final day on the gorge was one of goodbyes and of photo taking. The last stretch of trail before returning to the road and the bus back to Lijiang offers amazing panoramas of the canyon’s sweeping vistas and the vast horizons beyond. Looking back toward the trail’s beginning, Haba Snow Mountain and Jade Dragon Snow Mountain extend into the skies with one on each side of the gorge, sliced sharply in two by the Yangtze. 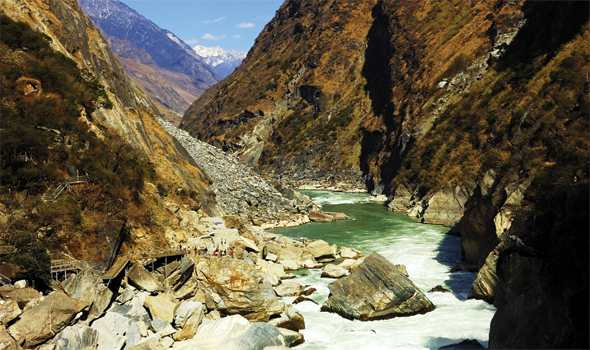 Tiger Leaping Gorge is one of the few remaining places in the world so undisturbed that even the “flawed” dirt paths and muddy slopes are made perfect in its splendor. As more infrastructure is forced into the natural beauty of Tiger Leaping Gorge, I fear it may lose some of its grandeur to the masses of tourism. But for now, Tiger Leaping Gorge still exists as a place off the beaten track where peaks rise to the heavens and myths meet the helm of reality. Unearthing Asia is a travel zine focusing on Lifestyle, Culture and Attractions all over Asia. Don’t miss out on the best travel ideas and inspirations in the region of Asia, such as this list of top attractions in Ho Chi Minh City. Kenya holidays are popular for the incredible wildlife. The grasslands of the Serengeti in the west of Kenya have prides of lions along with magnificent elephants, zebras and more.